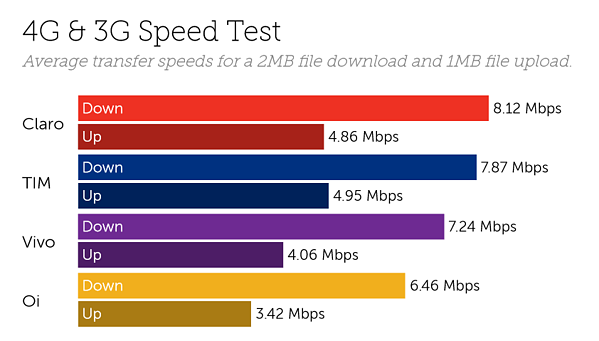 Claro and Vivo continue to battle for the fastest average download speeds in Brazil, with results not too dissimilar across all operators. TIM continue to lead latency overall as Claro inch ahead for 4G upload speeds in our latest crowdsourced report based on data collected in November. In November, Tutela recorded similar average download speeds across mobile operators in Brazil, with Claro just coming out ahead of the pack, averaging 8.12 Mbps from more than 883 thousand download speed tests across both 4G and 3G. TIM and Vivo weren’t too far behind, averaging 7.87 Mbps and 7.24 Mbps respectively, with Oi taking fourth place averaging 6.46 Mbps across the country. Interestingly these rankings change when we split 3G and 4G tests, as Vivo move up to second place on 4G and TIM down to fourth. 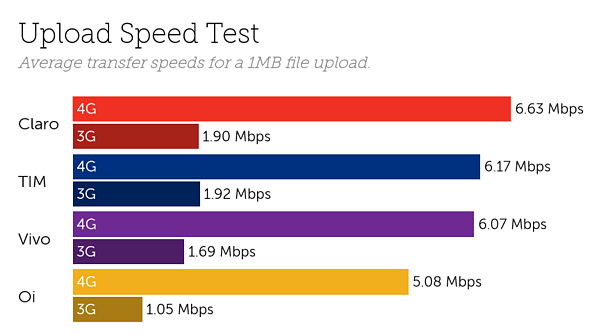 Claro retain first place with average 4G speeds of 10.61 Mbps. On 4G, Claro averaged quickest upload speeds in November, with results from more than 728 thousand tests averaging at 6.63 Mbps. On 3G, they’re just pushed back to second place as TIM outperform with an overall average score of 1.92 Mbps. Vivo and Oi place third and fourth, averaging 6.07 Mbps and 5.08 Mbps on 4G respectively. Similarly to our September report TIM retain the lead for latency, although results across the operators are close, each averaging a delay of between 25 - 30 ms on 4G across Brazil. These results drop in São Paulo to between 15 - 19 ms, as Oi move up to second place and 16 - 21 ms in Rio de Janeiro, where Oi take the top spot. Our findings for Brazil are based on 110 billion network quality measurements including 9.43 million speed tests in November 2018. Our latest complimentary Mobile Experience Report is available to download from the Tutela Insights portal.